German Chancellor Angela Merkel, 28 June 2018. GERMAN CHANCELLOR ANGELA Merkel warned today that the migration challenge could determine Europe’s fate, hours ahead of a Brussels summit where EU leaders are expected to clash over the way forward. “Europe has many challenges but migration could end up determining Europe’s destiny,” she told German lawmakers. The path the EU chooses could decide if the bloc is viewed by others as a credible defender of the values it espouses, she said. Europe can decide to “overcome the challenge in a way that people in Africa or elsewhere believe that we are guided by our values and that we take a multilateral rather than a unilateral approach,” Merkel added. 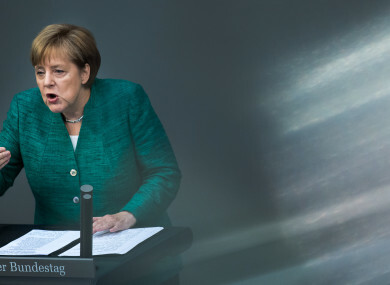 “That’s why the stakes are high,” said the German leader, who is also battling a domestic rebellion over her decision in 2015 to open Germany’s borders to asylum seekers fleeing war and misery in Syria, Iraq and elsewhere. If a deal cannot be reached between all 28 of the bloc, Merkel said that a compromise must be found among “a coalition of the willing”. But the guiding principle of any accord must be multilateral and must not put disproportionate weight on frontline countries, she stressed. “Certainly that’s not a perfect solution, but it’s a start toward better control and order” of the migration problem, she said. The stakes for Merkel are particularly high, as her Interior Minister Horst Seehofer has given her an ultimatum to find a solution at Thursday and Friday’s summit to curb new arrivals, failing which he would defy her and turn away migrants at the border. If Seehofer carries through with his threat, it could spell the end of Merkel’s coalition with his CSU party. Email “Merkel warns that migration 'could decide Europe's destiny'”. Feedback on “Merkel warns that migration 'could decide Europe's destiny'”.